Royalsell Solar Fountain Pump, Free Standing 1.4W Bird Bath Fountain Pump for Garden and Patio, Solar Panel Kit Water Pump (Classic) | Fountain City Art Ctr. ▲This product is a solar direct driving pump without additional battery, the height of the water depends on the strength of the sunlight. When the sunlight is weak, the pump will not work continuously, but it will start automatically and repeatedly. If the sunlight is strong enough, the pump will work properly. Please place the pump in full sunlight, otherwise the pump will not work properly. ▲Product can float on the water. Do not need the external power supply. The Pump must be immersed in the water completely. Insert the nozzle after the pump work normally as there could be air in the pump. ▲Easy to install, Easy to operate. As long as there is direct sunlight, the pump will be able to start work. Keep water clean and clean up the pump regularly in case the pump break down caused by any foreign matter. ▲Widely used in garden decoration, birdbaths, small pond water circulation oxygen, rockery fountains and other places. Please use a length suitable thread to fasten the sucker to the pump to avoid the fountain drifting back and forth. ▲5. Then put on the plug to see if it could work well. 【No Charger Needed】 Powered by solar energy, 100% safe and environment friendly. 【Floating Design】 Just put the fountain pump on the water, then just wait it turn on and work automatically. 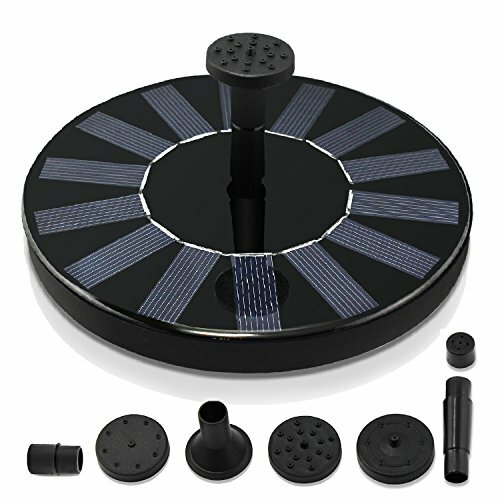 【Quick Start-up】 If the solar panel get enough energy, it will start in 3 seconds. 【4 Different Outlet Covers】 Aim to create various water splashing types and save water. 【Detachable Water Pump】 Easy to remove and clean regularly to extend the using life. If you have any questions about this product by Royalsell, contact us by completing and submitting the form below. If you are looking for a specif part number, please include it with your message.